The history of the Forward Racing Team began in 2009, when Kawasaki decided to withdraw from the World Championship. Media Action, a communication and marketing agency, that was already operating in the MotoGP paddock, saw the opportunity to start a new adventure. After having the infrastructure and manpower, that was once work in Kawasaki, already in place and being already deep within the motorcycle racing sphere, they ventured into this new adventure, embracing the new Moto2 philosophy of brining the racing in the medium category on a more sustainable economy. Giovanni Cuzari, by that time CEO of MEDIA ACTION, guided by his passion for this sport, decided to trust this new, ambicious and ecxiting project, in form of the FORWARD RACING TEAM in the debut season of the Moto2 category. From the earliest beginning in the Qatar, the team immediately showed its potential kicking off its campaign with a front row start and a podium finish at the season opener. During the year more podiums followed, with the highlight being a victory in Silverstone. Thanks to the experience of the team me bere and the during the with Jules Cluzel and Claudio Corti competing for the team. 2011 proved to be a test season, surrounded by a series of complications that the team overcame brilliantly and managed to turn a difficult year into a year of consolidation. In the same year a large and prestigious Italian company, NGM Mobile, became the main sponsor in FORWARD RACING, officially giving birth to NGM Mobile Forward Racing Team. Sharing common goals, both companies agreed to a sponsorship plan signed on a multi-annual basis. In 2012 NGM Mobile Forward Racing Team made another step forward by entering the MotoGP class with Colin Edwards in the first year of CRT rules, as well as continuing its Moto2 adventure with Alex De Angelis and Yuki Takahashi. In the MotoGP category the team will always be remembered as the first team to get both, the pole position and the win at the first Grand Prix in CRT history. In Moto2 a third place at Sachsenring and a spectacular win at the Malaysia GP showed the constant development of the team driven by experience, competitiveness, cooperation, motivation, ambition, energy and passion, that have been and will continue to be the stimulating factors of NGM Mobile Forward Racing Team. 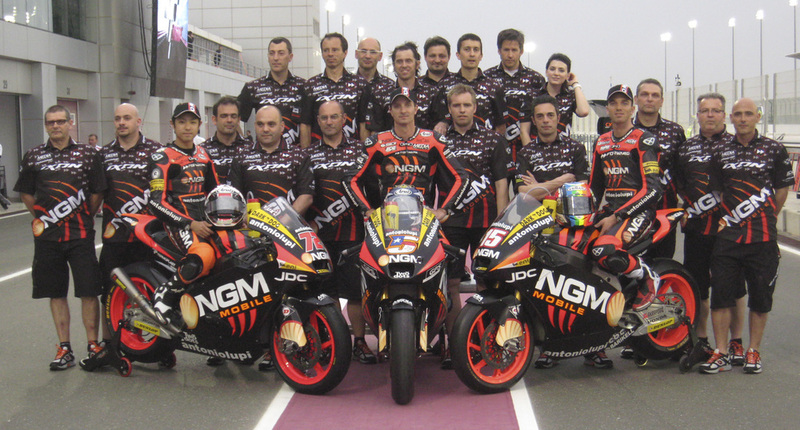 In 2013 the team literally doubled its number of riders and bikes in both, the MotoGP and the Moto2 class. In MotoGP Texan Colin Edwards (double Superbike World Champion) was joined by Italian Claudio Corti. Alex De Angelis teamed up with Spaniard Ricky Cardus and fellow Italians Simone Corsi and Mattia Pasini. The 2014 season started with a new challenge and a rider line-up, which was even stronger. NGM Mobile Forward Racing Team renewed its commitment to world-class motorcycle racing entering the new Open Category in MotoGP World Championship with the experienced Colin Edwards and talented Aleix Espargaro, the overall CRT winner for two consecutive years. Alongside the MotoGP team, the NGM Mobile Forward Racing Team confirmed the Italian duo of Simone Corsi and Mattia Pasini in the Moto2 class. Aleix Espargaro and the team finished the season winning the Open Class World Championship, celebrating one podium in Aragon and one pole position in Assen. The line-up in 2015 was completely renewed with the new duo of Stefan Bradl and Loris Baz in MotoGP, riding the Forward Yamaha as well as Simone Corsi and Lorenzo Baldassarri in Moto2 with the Kalex bike. The season ended up on a high note as Loris Baz was able to come second in the general standings of the Open category, while Lorenzo Baldassarri climbed up the podium for the first time and finished off the season as top-scoring rider from Italy. In 2016 the team focused on Moto2 with a full VR46 Riders Academy line-up consisting of Lorenzo Baldassarri and Luca Marini, of which the latter just graduated from CEV Championship. With a first win at the team’s home round in Misano, Baldassarri completed the season in eighth position overall, while Marini delivered some top ten results during his first campaign at World Championship level. The 2017 saw the same lineup of the preceding year for the team Forward in grate of departure. But with the entry of the team also in the championship of preparation to the world championship, the CEV, as principal exponent has introduced Lukas Tulovic and Federico Fuligni. The season is concluded enthusiastically with a qualification on the Catalan circuit of Baldassarri, that saw him actor at the third position on the grid. 2018 season’s principal exponent of the Forward Racing Team are one of the VR46 Riders Academy’s cadet, Stefano Manzi, and the young Brazilian talent, Eric Granado, whom has concluded the last season as European champion of the CEV (Speed European Championship) and also winner of the Brasilian’s championship. In 2018 the project was launched in collaboration with Mv Agusta, the Italian brand and the world’s most successful motorcycle manufacturer: the aim was to bring Mv Agusta, after 42 years of absence, back into the spotlight on the world stage. In July 2018, for the first private tests, the first prototype of the Mv Agusta F2, which will compete in 2019 in the Moto2 category of the World Championship, went on track.